Mr. Paul Edward Johnson, age 80 of Wilkesboro passed away Thursday, November 29, 2018 in Florida. Funeral services will be held 11:00 AM Wednesday at Pleasant Grove Baptist Church with Pastor Brady Hayworth, Rev. Jim Wyatt, Rev. Phil Chapman, and Dr. Charles Whipple officiating. Burial will be in Ladonia Baptist Church Cemetery in Mt. Airy. The family will receive friends Tuesday evening from 6:00 until 8:00 PM at Reins-Sturdivant Funeral Home. Mr. Johnson was born November 15, 1938 in Surry County to John Frank and Olevia Hemmings Johnson. 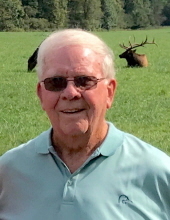 He was a member of Pleasant Grove Baptist Church and was the owner/operator of Quality Control, Inc.
To know Paul is to love family, all things old, fishing, hunting, but most of all, “God.” Paul came to Wilkes from Surry County in 1961 and worked for the Coca Cola company. In 1983, Paul began his pest control business with more concern for his employees than himself. In addition to his employees, he loved “old” log houses, barns and bringing them back to life. He started collecting and repurposing 100-year-old logs first on the family farm in Surry County. Over the next 25 years he built 8 log homes in Blowing Rock, NC. It started as a hobby and like all things he was involved with, he put his “hands-on” work ethic to work and enjoyed every minute of the process. He worked with many builders and listened to their suggestions, but in the end it was built just as he envisioned. While his life and business moved in a positive direction he enjoyed seeing his daughter grow and become a dedicated minister of music. Nothing made him happier than to see his daughter doing God’s Will. Paul also loved music and was the choir director at Pleasant Grove for 35 plus years. He also taught Sunday School and was an active deacon. His wife was the love of his life and best friend. They enjoyed getting out and taking car rides and loved traveling all over the country. But nothing put a smile on his face more than when he talked about his two beautiful granddaughters. They were his world and he loved to brag on them and their accomplishments. He was preceded in death by his parents a son; Paul Edward Johnson, Jr. three brothers; Greer Johnson, Otis Johnson and Bernie Johnson, two sisters; Vera Moseley and Dorothy Riggs. He is survived by his wife; JoAnn Simcox Johnson of the home, one daughter; Larisa Leapley and husband Mickey of North Wilkesboro, two grandchildren; Olivia Ann Leapley, Sydney Elizabeth Leapley, four sisters; Foy Younger and husband Birchard, Georgie Mosley all of Mt. Airy, Kathleen Hege and husband Alex of Lexington, Geraldine Sykes and husband Rayburn of Mt. Airy and three brothers; Wade Johnson and wife Mary Lou, Billy Gray Johnson and wife Rita, Jimmy Johnson and wife Nelda all of Mt. Airy. Online condolences may be made to www.reinssturdivant.com. To send flowers or a remembrance gift to the family of Paul Edward Johnson, please visit our Tribute Store. "Email Address" would like to share the life celebration of Paul Edward Johnson. Click on the "link" to go to share a favorite memory or leave a condolence message for the family.